I just love a good pizza recipe. You have probably already picked up on that though. This recipe is a more classic pairing and a very easy one to assemble for a quick weeknight dinner. 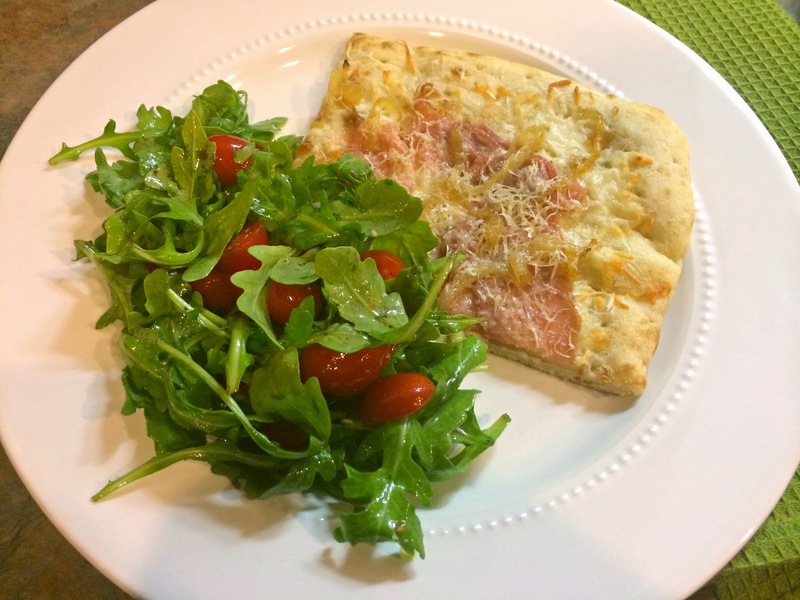 The pizza is a simple combination of grated cheeses, prosciutto, and caramelized onions. It's rich and savory and pairs perfectly with the spicy arugula, sweet tomatoes, and tangy vinaigrette dressing. In Italy they traditionally serve this salad right on top of the cooked pizza. I like mine on the side-- so that you have the option to eat them together or separately. In Italy they also call it 'speck pizza with rocket salad.' We aren't doing that here either. Also, to make this dinner come together even faster I sometimes caramelize a few onions on a Sunday when I have more time. I refrigerate them and then use them in recipes throughout the week as needed. You may need to microwave them for 30 seconds to soften them up when you use them, but that's it. Heat a saute pan over medium heat and add butter and 1/2 Tbs. olive oil. Once melted, swirl in the pan and add onions and a pinch of salt and cook, stirring often, until the onions are soft and slightly browned, at least 10 minutes. Remove onions from heat and set aside. Lightly coat a baking sheet with cooking spray and place crust on top. Brush the top of the crust with the remaining 1 Tbs. olive oil and then sprinkle evenly with mozzarella, leaving a 1/2-inch border. Arrange prosciutto and onions on top of the mozzarella and then sprinkle with Parmesan. Bake for 10-12 minutes or until cheese is melted and golden. Remove from oven, cool for 5 minutes, and slice. While the pizza is baking, whisk the lemon juice, oil, honey, Dijon, salt, and pepper in a medium bowl until incorporated. Gently toss the arugula and tomatoes in the dressing until evenly coated. Serve salad on top or on the side of the sliced pizza.